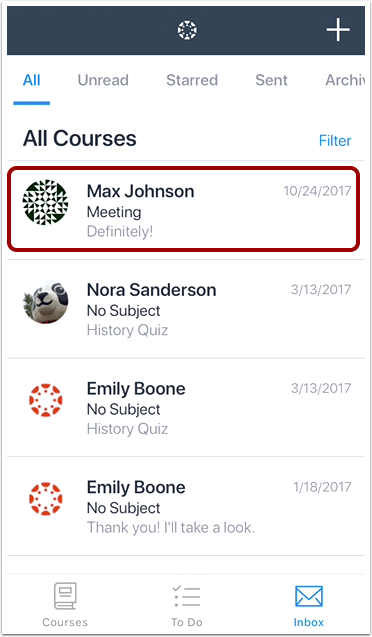 How do I view the Conversations Inbox in the Teacher app on my iOS device? 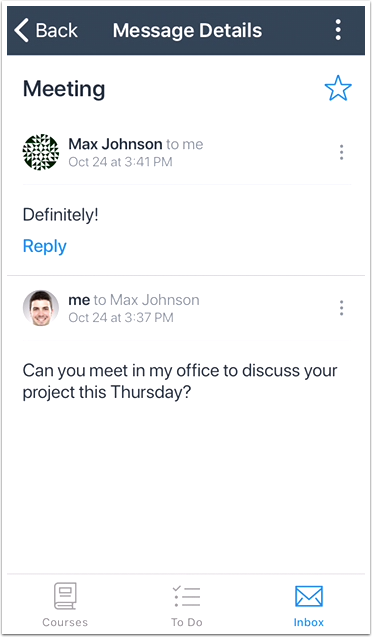 Note: Unlike the web version of Canvas, you cannot view assignment comments in Conversations. However, you can view comments in the assignment. In the Dashboard, tap the Inbox icon . If the inbox icon includes a numbered badge, the badge shows how many unread Conversations messages you have in your Inbox. The Inbox defaults to the All tab and displays all your messages. The layout is the same way as the browser version of Conversations. Messages are arranged in chronological order—newer messages appear at the top, and older messages appear near the bottom. New messages are indicated with a dot that aligns with the course color. Note: Messages cannot be archived in the Teacher app. To send a new message, tap the Add icon. To forward or delete the entire message thread, tap the message More Options icon . 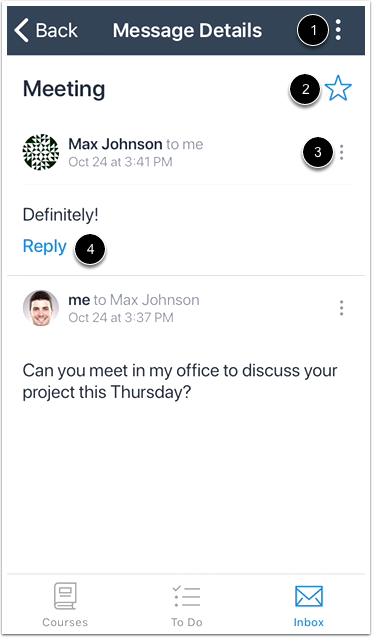 To forward or delete an individual message in the thread, locate the message and tap the More Options icon . Previous Topic:How do I view the To Do list in the Teacher app on my iOS device? 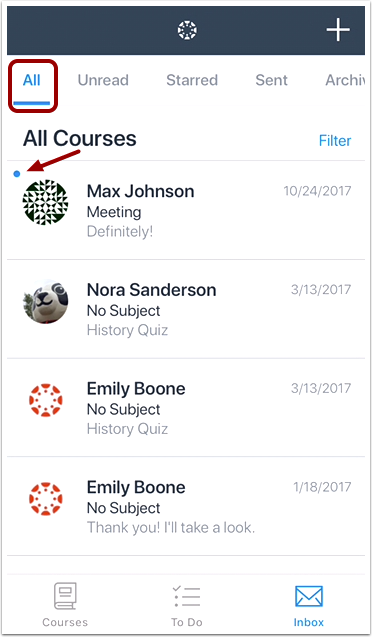 Next Topic:How do I send a message from the Inbox in the Teacher app on my iOS device? 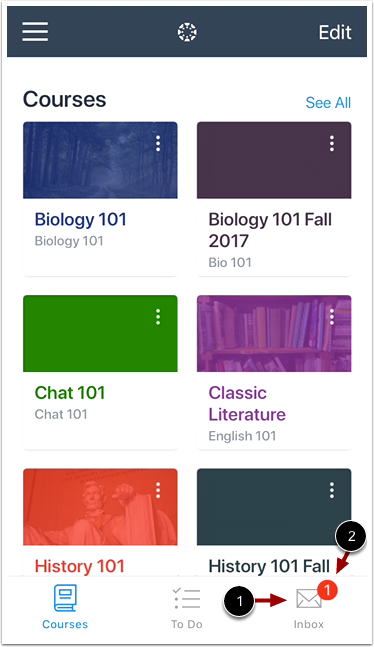 Table of Contents > Courses > How do I view the Conversations Inbox in the Teacher app on my iOS device?